This time of year when the weather is perfect for spending outdoors, people are constantly on the hunt for porch decorating ideas. One of the most simple and affordable solutions that will enhance the appearance of your screened porch is to add some greenery. Mediterranean Natives: One of the biggest challenges to overcome when selecting plants for your screen porch garden is the high amount of shade your plants need to tolerate. With this in mind, plants like Cyclamen are ideal as they don’t need much sun and they produce gorgeous red or violet blooms from December through April. Tropical Succulents: These plants are drought resistant and don’t require much water, so if you have a tendency to underwater everything you plant, succulents are a great choice for you as they are very low maintenance. 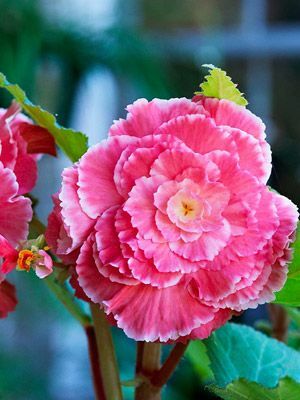 Tuberous Begonias: Hanging flowers on your screened porch is a great option if you don’t have extra floor space, and tuberous begonias do particularly well in hanging pots. These plants will give you the added pop of color that you are looking for with their bright yellow and pink blooms. For more porch decorating ideas, please contact us at Weather Queen Shades. Our shades will help protect all of your beautiful screen porch decorations!